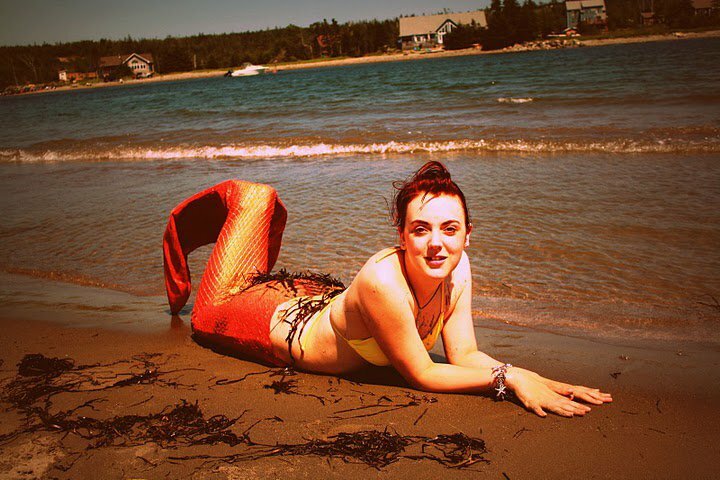 So I came across the glamorous Raina the Halifax Mermaid (who’s known in her human guise as Stephanie) on Facebook, which has been instrumental in bringing together mermaids from around the world and cementing “mermaiding” culture. And you thought Facebook was just a way to cheat on your spouse with your high school crush! 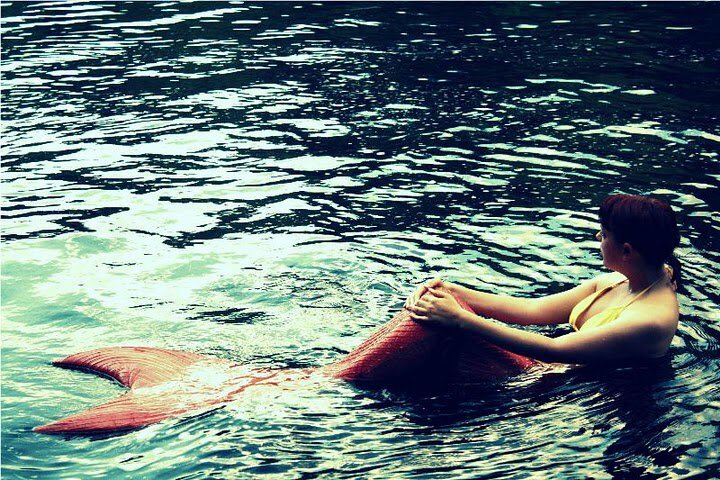 But really, the only way to be a mermaid a couple of decades ago, before you could buy realistic-looking tails and before you could go online to find your tribe, was to head to Weeki Wachee or star in a mermaid film. 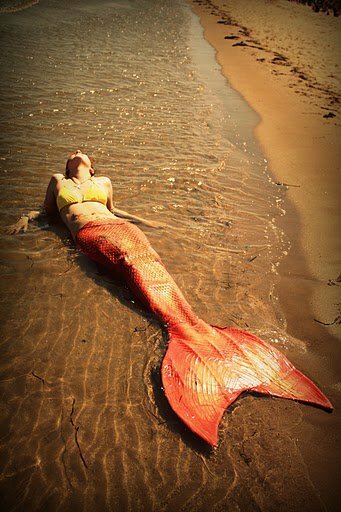 Now there’s a whole mermaid culture out there, with men and women wearing tails, taking to the waters and embracing their more magical selves. Raina is a gorgeous example, and, like many mermaids, she’s committed to ocean conservation and education. Not to mention general sparkling gorgeousness and the well placed rhinestone. You say on Facebook that you’ve always been “inspired by mermaids and seeing other young women use a mermaid identity as a way to educate and bring joy to others.” What women inspired you to embrace your own mermaid identity? Like many young women I was inspired by Hannah Fraser [read this blog’s interview with Hannah here]. I sort of always knew I wanted to make something like this happen but not until the internet opened up my world did I believe it to be possible. When I found Hannah I really resonated with her. I am also a musician, model, photographer, and an artist. 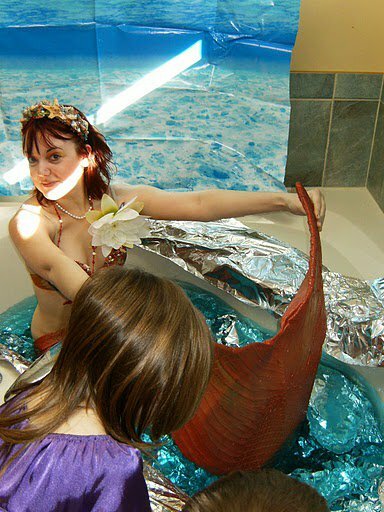 I always felt like I had a “lot going on” and being a mermaid was a great way to streamline those interests – Hannah was proof of that. I did some scoping for buying a tail and came across the Annette Kellermen story and wow what a lady! She was really the first person to be a mermaid and she really broke down walls for women just by wearing the type of bathing suit she wore and being so well known for her swimming in a time when women were considered not equal and any good thing they did was always attributed to the man in her life. Suddenly being a mermaid didn’t just speak to the artist or activist in me… it spoke to my feminist core and the wheels started turning! How does that identity differ from your regular, human one? Stephanie is a student teacher who has wicked bad health problems, a bit of emotional baggage, not the bravest in the bunch, pretty clumsy, and feels stifled creatively on a regular basis. Raina on the other hand is calm and collected. She’s graceful and focused on her goals and under the water her health rarely holds her back. Raina gives me a confidence I’ve never really known and the ability to share so much with so many. Through Raina I’ve met and made more real friends then I ever did as Stephanie and perhaps that’s because Raina is just an outward expression of my true inner-self. The gap between the two is closing though and Raina and Stephanie are becoming one and the same. I’m starting to realize it’s not the fin that makes the mermaid- it’s her spirit! I grew up in an abusive home and was very separated from the outside world. I only really had a younger sister and our imaginations. The year she was born the Little Mermaid came out. While most people resonated with the love story I always projected my feelings about abuse on the movie. Ariel’s father yelled at her and was mean (in my eyes) and scary. Yet she still found the courage to break away from him and do something for herself that no one ever felt possible. I clung to that as a child. Fairy-tales were my escape. I saw Splash some years later and like many mers out there it inspired me as well. Mermaids seemed so brave and willing to venture out into the unknown. My love for mermaids went hand in hand with my love of the sea. How did it feel to put on a tail for the first time? What’s it like swimming in a tail? I have two tails currently. The first one is made of stretch vinyl and was equipped with two swim fins. I had been VERY sick prior to that and was quite nervous about trying to swim in it. I started big – with a lake! But was a bit of a wimp so believe it or not I put on the tail AND a life jacket ha! I pushed myself off the dock and had a mini heart attack as the tail filled with water. It wasn’t long before I got the hang of it but it didn’t look like what I’d seen online and didn’t feel like how I expected it to. Mostly I just swam using my arms dragging the tail behind me. It was great for photos but really shows the difference material and a monofin can make. My next tail was a Mertailor tail [read this blog’s interview with the Mertailor here] that was the result of a lot of financial donations from other artists. 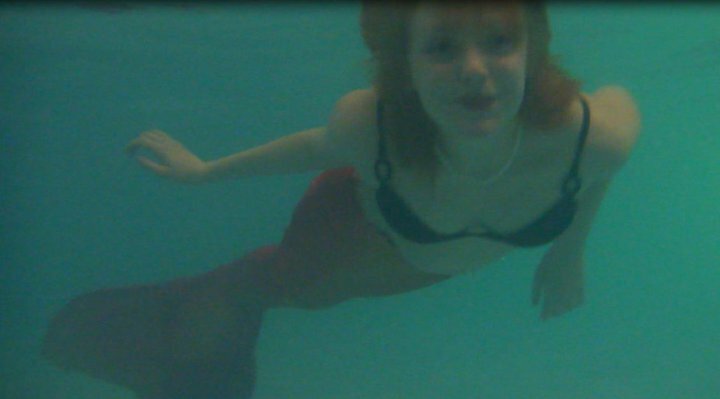 I used my first tail as a practice tail and was eager to try out my mertailor one. What a job it was getting inside of it! I think I swam 3 times in it before I realized how to actually put my feet in the monofin. Unfortunately the tail didn’t fit and it would be almost a year before mermaid Raven of Merbellas was able to add an extension piece to it so that I didn’t end up swimming out of it. Once that was all together, after years of failed attempts, I went for my first real swim with a tail that worked and fit… and my mind was blown! It took a few sessions to get the dolphin kick down seeing as I’m from a climate that is only warm enough for outdoor swimming two months out of the year… but I’ve been practicing as much as I can in indoor pools and I’m excited to get it to the lakes and oceans this summer. How do people react to you as a mermaid? Before and after my tail “fin lift” as I call it, people were always amazed by how realistic it was. As I am not from a warm climate people have never ever seen anything like this before and they always do a double take. Adults behave like kids and run up to feel it without even introducing themselves and if I pull the “oh that tickles” trick on them they actually react as if they were embarrassed they tickled me. Children believe almost instantly and I rarely have any say ‘that’s not real’ and I think part of that is due to the Mertailor’s fluke design and the ability I have to move it in a wave motion through the monofin. It always positive and mostly shock! I understand that you educate people about ocean related ecology issues. Can you tell me about this? I am a student teacher and one of the things I do with Raina is work on ways to make connections to our local curriculum. Where I am from becoming a teacher takes two degrees and I am in my sixth year of university with one more to go so I’ve had a LOT of time to decide what I feel is important. On a local level we have the second biggest harbour in the world and it’s had raw sewage pumped into it for 100 years! We recently installed a treatment plant that broke shortly after and is hopefully back up and running for good. We do a lot to create a green environment on land and despite the city campaigns to raise awareness of the importance of not dumping things down the drains that lead to the harbour people really do have a mentality of “it’s not a big deal the sea will wash it away”. This is a mindset I really want to break. In addition as the East Coast of Canada is central with fishing and so much livelihood is based around it I think it’s essential people understand the devastation that can be caused to the sea and our way of life from over fishing and inappropriate fish farms. Everything comes back to the ocean. Everything originates from the ocean. People need to understand that cycle and respect the balance. It’s easy to ignore an add on TV or a sign on the street… it’s not easy to ignore a beautiful mermaid begging you to take care of her home! 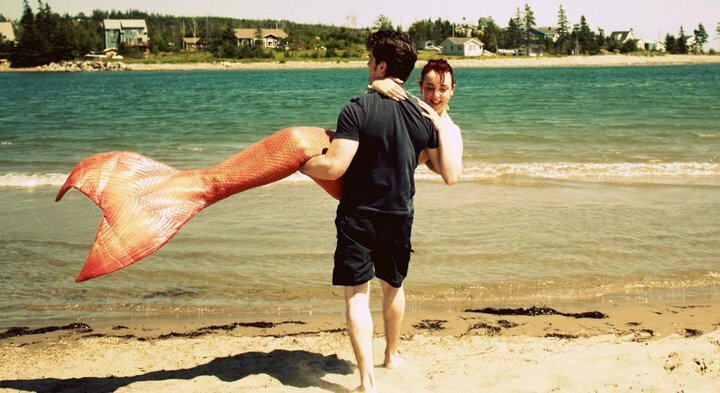 Is there any kind of mermaid tradition in Halifax, where you live? Halifax is a sea faring community. We have graves here from Titanic victims, ghost stories of pirates and rum runners and the occasional story of mers through legends and literature. Every year Halifax adopts an icon of sorts that local artist’s paint. The icons are then placed around the city during peak tourist season and afterward auctioned off for charity. 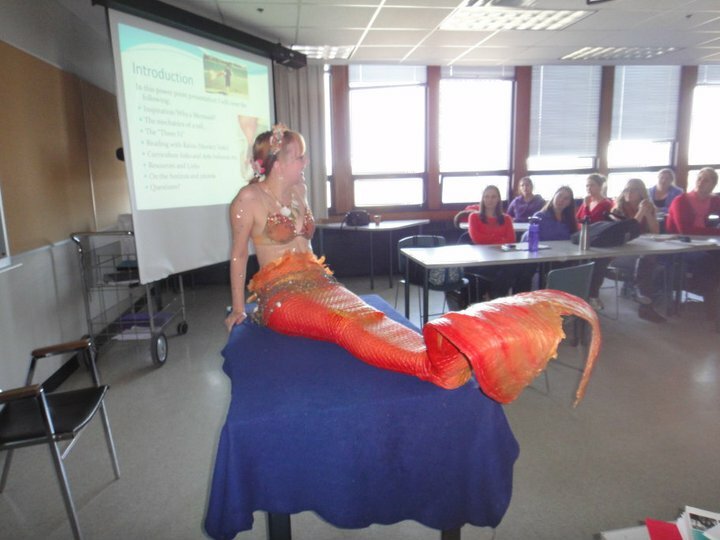 We’ve featured dolphins, lobsters, and my favourite: mermaids! We have a Mermaid Theatre, bars with mermaid imagery, and a Mermaid and the Cow campground! 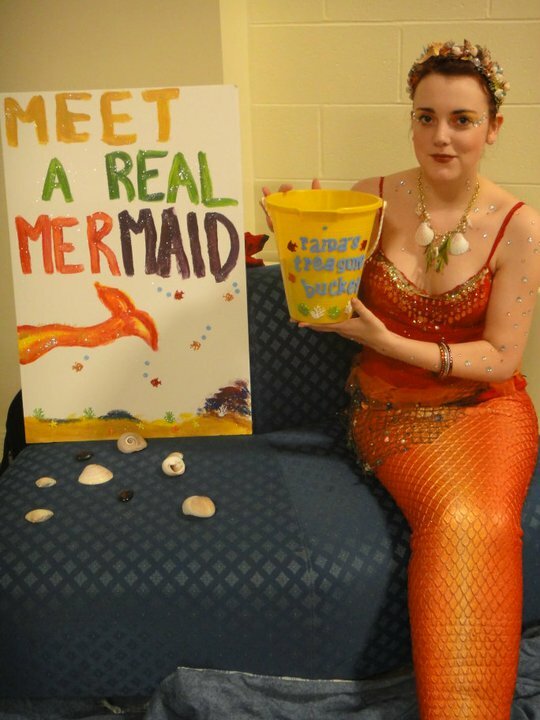 And finally, what advice do you have for aspiring mermaids?